The process of 3D modeling has become a necessity for digital creative work. A skilled modeler can secure a job in many industries which definitely includes the entertainment industry from video games to 3D animated movies. But mastering the art of modeling can be a challenge, especially to newcomers. There is so much to learn and it can take a while to really feel comfortable in modeling software. The shortcut to mastering this skillset is to take online courses and work hard practicing on your own. These courses still require hard work and effort on your part. But if you’re willing to put in the time I guarantee you can become a master of 3D modeling and put it to good use. I’ve mentioned the online school CG Spectrum many times in past articles. We even did a full review of their online concept diploma course. What sets CG Spectrum apart from the rest is their commitment to high-quality education from people who have worked in the industry. When you study with CG Spectrum you’re studying under trained professionals who’ve worked on movies, TV shows, and video game projects. They have real-world skills and share their knowledge freely in their online training. Everything is managed online so this works just like an online course. Although if you follow their diploma track you get a certificate at the end. My recommendation for a beginner is the Intro to 3D Modeling course. This has no prerequisites so you can dive in as a total noob and learn the ropes fast. The course runs for 6 months which means you’ll really need to set aside some time for learning. It’s not the easiest subject to master but you will have a lot of support from your instructor and your fellow digital classmates. I always say that learning isn’t linear if you know how to learn. The right courses will skyrocket your skills from novice to pro in a timely manner and help you build confidence along the way. That’s exactly what CG Spectrum offers: a professional online education that’ll take even a complete novice and turn them into skilled pro that can easily land a job given the right portfolio. Estimated course load is around 20 hrs/wk which averages about 3 hours per day(including weekends). That should be doable even with a fulltime job. Plus you get direct access to the instructor for questions, critiques, everything. They also offer an advanced 3D diploma course which runs for 1 year and covers both modeling and sculpting together. This path works best if you’re willing to be a fulltime student and dedicate a year to your studies. Overall I cannot give enough praise to CG Spectrum’s training. They do online education the right way and their prices are often 10x cheaper than a university. Oh, and if you did go to a university you’d be studying under various professors of different backgrounds. CG Spectrum only hires industry pros for their instructors(called “mentors”). So you get a top-notch education at a fraction of the price, learn from people who have worked in the industry, and you can do it all from your computer anywhere in the world. No doubt in my mind CG Spectrum’s 3D courses offer the best education for serious students. If you want something a little lighter without so much commitment have a look at Pluralsight. They’re an online subscription library with a bunch of courses on programming, IT, and general technology. This certainly includes 3D modeling courses which are a big part of their library. With a Pluralsight subscription you pay a monthly fee and get access to their massive collection of video courses. It totals over 6,000 courses on a variety of topics, mostly technical subjects. The cool part of Pluralsight is that you can learn at your own pace. This isn’t a classroom setting with a live teacher so it’s all on your shoulders to learn. This can also be less of a stressor if you’ve got a busy schedule. And you’ll find videos on pretty much every modeling program from Blender to Maya and everything inbetween. We published a detailed review of Pluralsight covering it’s value for CG and 3D artists. If you’re even a little bit curious to see what they offer definitely skim that review. A nice added bonus with Pluralsight is that you can pay for an instructor’s time directly through their mentoring setup. This way you still gain access to professionals if you need help, but you aren’t forced to get on a call or share your work with anyone. The mentoring feature does cost extra so it won’t be for everyone. And to be honest the monthly subscription gives you so many resources that you’ll be busy for a while. If you don’t like the idea of online schooling and just want some private courses to work through on your own, Pluralsight is definitely the way to go. Now if you’re still on the fence you can always sign up to Pluralsight for a no-cost free trial period. You sign up with your credit card but it’s not billed until after the trial ends. Don’t like what you see? Just cancel before the trial expires and you’ll never be charged a dime. Another option is one of Pluralsight’s direct competitors, Lynda.com. 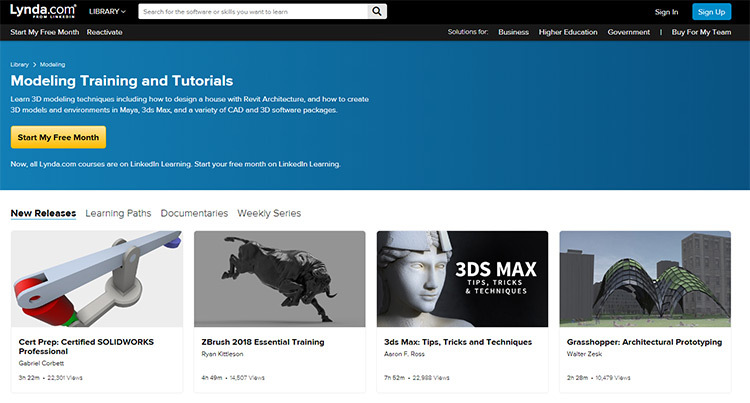 They offer similar courses but don’t have as much variety in the 3D space. However I did want to include them here because Lynda has some modeling courses. When you sign up to their library you pay a monthly fee just like Pluralsight. Then you get direct access to all of their video courses. However they do not have a free trial. With Lynda I personally find a lot of their material to be more beginner-focused. But there’s a lot more of it. You can learn web design, video editing, VFX, even some basic art & illustration lessons. To me that’s the real selling point of Lynda: variety. If you’re looking for more of a 3D and tech focus then I do recommend Pluralsight over Lynda. But I’m almost certain that Lynda’s video library is larger as a whole, it just covers more topics. You can always check out both and see what you think. I’ve mostly reviewed CGMA’s courses from their 2D art education library, but they offer a lot in the way of 3D stuff too. In fact they have an entire category of 3D courses ranging from character design to rigging for animation. I understand that CGMA might be a tough sell because their courses go for a pretty penny. As a newcomer this can be intimidating. If you’ve used them before then you’re familiar with their quality of teaching and their incredible instructors. This is what justifies the pricing: direct access to a professional who can help you out and critique your work along the way. My recommendation for a solid course on 3D modeling from CGMA has to be this one. Intro To Production Modeling may sound a little generic, but that’s also a good thing. It’s made for beginners since there are no prerequisites other than some familiarity in Maya and ZBrush. This 5-week course teaches you everything about the production pipeline for digital modeling and how that skillset is utilized in a typical creative team. Especially for entertainment projects like video games. The aim of this course is to expose you to all of the things that you need in order to be successful in a professional work environment as a 3D modeler. It’s really as simple as that. You’ll learn all the fundamentals of modeling and what sort of tasks you’d be required to do in that kind of job. Granted you may be looking into modeling as just a hobby for now. In that case go with Pluralsight for their larger library and cheaper courses. But if you’re serious about learning to model and want to do this as a career then CGMA is a fine choice. 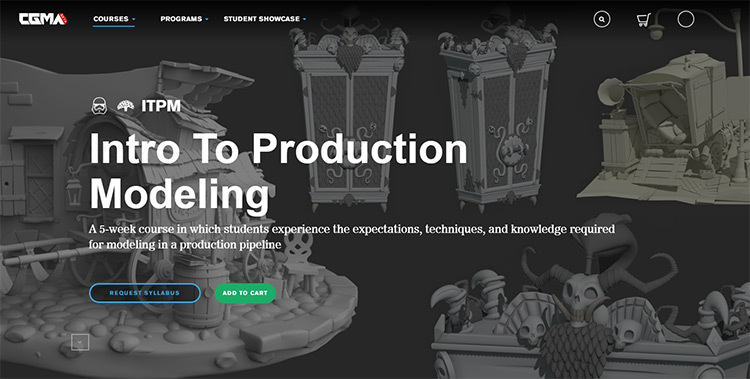 The Mold3D Academy offers a tremendous amount of online coaching for 3D artists. You can take 1-on-1 lessons for private tutoring at a premium, or pay for their online classes with a digital classroom setting. Or they even have modeling & sculpting courses with a self-paced learning regimen so you can study whenever you have time. All of the instructors have some kind of background which is very similar to CG Spectrum. You’ll find instructors with a work history from huge companies like Disney and Blue Sky Studios so you know you’re learning from pros. I’d suggest browsing through their classes directory to see what’s available. The student work is beyond phenomenal. It’s really some of the best I’ve seen from an online school—right on par with CG Spectrum. Most of their classes run for 3 or 6 months and they change every term. This means (some) new instructors, new classes, and newer lesson plans. If you do want to sign up for anything I’d recommend their character creation course. 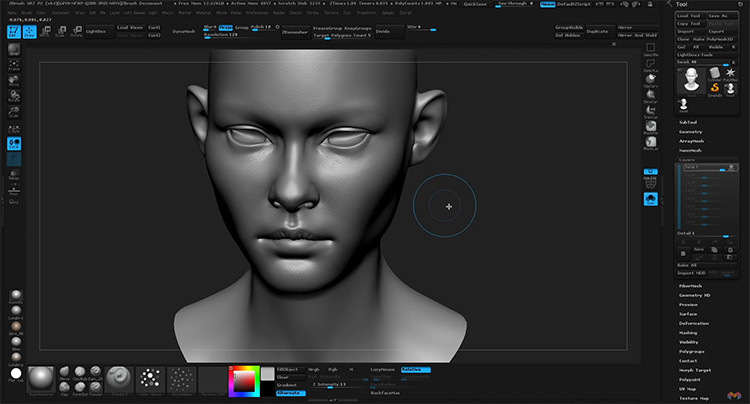 It teaches 3D modeling along with the basics of character design and sculpting in programs like ZBrush. Make a note of semester dates or try contacting the academy for more info. They’re very accommodating to new students regardless of skill level. Plus the exercises and homework you’ll get in each course is made to help you develop a sleek portfolio and land work in the 3D industry. I don’t always recommend Udemy because their courses are so hit and miss. You really have to read the reviews and get a sense of what you’re buying beforehand. However they do have plenty of modeling courses to pick from. And many of them are fantastic. 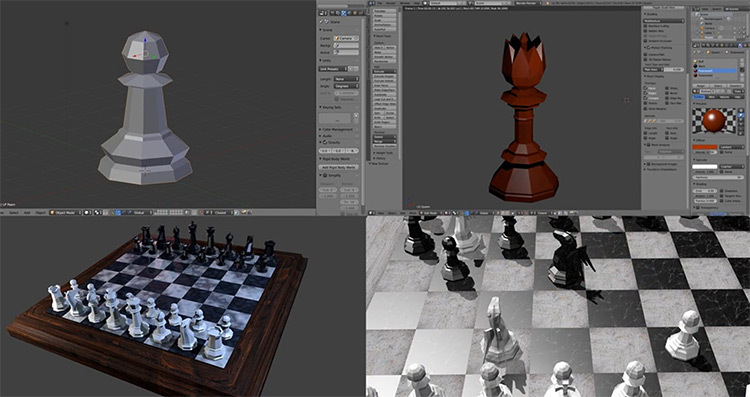 One of the best-selling courses in their entire 3D section is this Blender modeling course. It spans a whopping 50+ hours long with plenty of exercises to practice on your own. This video course will not help you master all the software available. However it will teach you the absolute basics of 3D modeling by using one of the best open source programs on the market: Blender. With Blender you’re never paying a dime and you get to learn in professional software. Yes there are many alternatives out there. But plenty of modelers use Blender daily and it’s got a quality reputation among 3D artists. With that Udemy course you’ll learn how to create models, color them, animate them, and learn all the fundamentals required for a full 3D modeling project. This is the kind of course a complete beginner should consume and study hard. There’s more info on the main course page but I also suggest browsing through Udemy for others if you have the time. I won’t recommend any other courses by name but I do think you can find gems in the Udemy library if you look hard enough. Still, for the money I cannot think of a better option than CG Spectrum. Their instructors are phenomenal and if you go with their intro to 3D course you won’t need any other online training to call yourself a professional modeler.